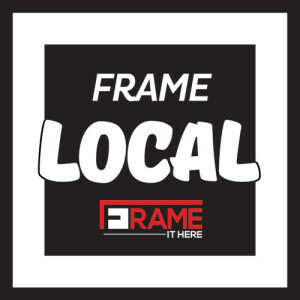 As the custom framing industry has grown and better equipment has become available, standards have become much higher. Wide frames and mat borders have become more popular than ever! They give more prominence to a framed piece of artwork or object. Wider frames are also more sturdy and reliable than a thin, one inch frame. When matting a piece of artwork, a customer used to expect a single, neutral colored mat in their design, simply to protect the work from sticking to the glass. However, we know now that the matting can contribute so much more than protection. By layering colors and textures, we can create a unique design that is particular to your taste and the décor of the room it will hang in, while making your artwork pop! In an interview between The Picture Frame Guys and Jennifer Patterson, the district sales manager at Jayeness Molding Co.; Washington State’s leading framing wholesaler, Jennifer was asked, “What makes a ‘good’ frame shop?” Quoting an industry executive at the West Coast Art and Frame Expo, she told them that, “the most important attribute was the experience that the customer has when in a frame shop.” Being innovative and design-driven is what sets our shop apart from the competition. Not only will your specifications be met, but you will also find your visit to be a learning experience. We believe that you should be informed on all aspects of your composition, while having fun in the design process! This is something you can look for at Frame It Here! We will focus on your needs as well as what works best for your artwork or object!